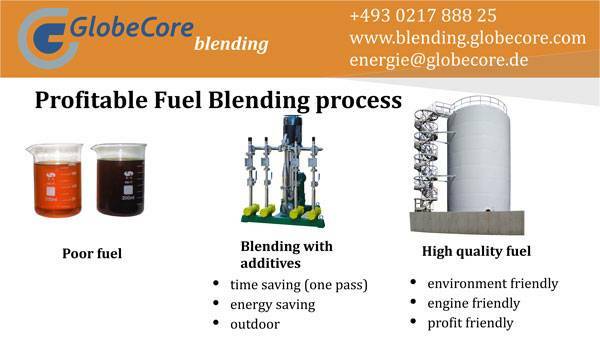 Installation for mixing and dissolution of any liquids in a stream of the GlobeCore Blending brand is intended for mixing from two to five separate components, in particular low-octane gasoline with additives and other components. At the usual methods of mixing known today, fuel at addition of separate components of parts has properties to be stratified. Feature of offered installation is that applying an injection method and hydrodynamic blow it is possible to raise octane (cetane) number of fuel thus stratifying of the received product doesn't occur within 180 days. Modern hydrodynamic mixing installations proved in commercial operation as economic, exact and stable means of production of high-quality motor fuels with optimum prime cost. The reached economy of means and increase in production profitability in comparison with traditional technology of mixing of components in mixing capacities can accelerate rates of return of capital investments to 60% in a year and provide payback of the project for term till one year and less.